Q: What are some ways you can improve? A: I can listen to my coaches more. A: Hard work and practice! Q:What are the goals you have set for yourself? A: Winning medals in swimming. SPORTS: Softball, Basketball, Athletics, and Cycling. A: Being myself is my secret to success! 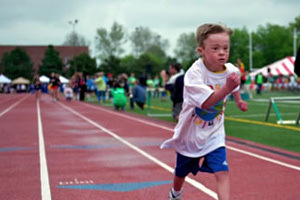 Q:What did you do to reach this level in Special Olympics? A: I am always friendly and I am always playing sports. Q: How does it make you feel when people use the R-word? A: It’s terrible. No one should ever feel that way. A: Graduating from high school is my greatest achievement. A: My favorite memory is making friends. A: My favorite accomplishment is winning gold medals. A: My secret to success is my angels sitting on my shoulders. Q:What are some ways you can improve? A: I can improve by practicing more and paying attention.